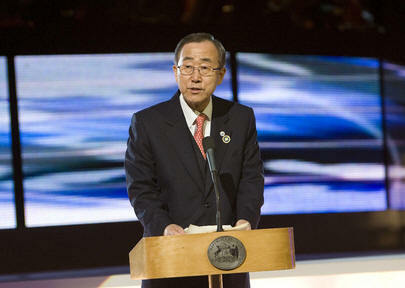 UNITED NATIONS, November 10 -- Speaking in Antarctica, apparently without questions from reporters, UN Secretary-General Ban Ki-moon said, "This trip, you may call it an eco-trip, but I'm not here as a tourist." Or did he? The UN's version of the quote, emailed out to UN correspondents, is "We joke among ourselves that we are on an 'Eco-tour,' but I am not here as a tourist." Emphasis added. Note, and hope, for the trajectory from defensive to collegial. During his tour of melting ice, Ban stopped at a South Korean scientific base where, the Associated Press reports, he was "greeted by a small reception and offered traditional Korean food and drink." The Antarctic ice sheet covers 13.6 million square kilometers, including islands and ice shelves, and has an average thickness of about 2,400 meters. The inland ice has a depth up to double that, making Antarctica easily the highest of the continents. Beyond the melting ice, troubling is brewing around Antarctica. The UK last month said it is considering lodging territorial rights over an area of the continental shelf off Antarctica covering more than 1 million square kilometers. Argentina and Chile immediately came out with their own claims. Other countries, including Russia, France, Australia, New Zealand and Norway, have lodged earlier claims or have reserved the right to do so. China announced this week that it would build a new third research station on the White Continent and beef up its scientific presence there. Similarly about the North Pole, countries bordering the Arctic Ocean are making competing claims to adjacent sub-sea territory that is thought to contain vast reserves of oil and natural gas. The bordering states are Russia, the United States, Norway, Denmark (through Greenland) and Canada. Diplomacy, anyone? Inner City Press: Has any arrangement been made to try to offset the carbon emissions caused by this travel to Antarctica? Associate Spokesperson: The issue of carbon offsetting is a complex and long-term challenge that would require creative thinking and a firm commitment to be addressed. For the Secretary-General's part, he wants the UN to lead by example, which is why, during the last meeting of the Chief Executive�s Board, just a few weeks ago, he obtained a commitment of all the heads of agencies, programs and specialized agencies to move their own organizations forward to what we call climate neutrality in their daily operations. But as for the specific trip to Antarctica that's taking place today, that's being organized by the Chilean Government, so we'll be checking with them whether any carbon offsetting arrangements have been made by them, after this. Some question whether, if the Secretary General is to lead, simply waiting to hear is the Chilean government carbon-offset its tour of the Secretary General constitutes leadership. We'll see. Inner City Press: You're visiting an ethanol facility, I believe in Brazil. One of your Special Rapporteurs on food had said that this use of land for biofuel instead of for food was hurting the poor and that there should be a moratorium on it. So he encouraged us to ask you, what's your view of the balance between food for the poor, under the MDGs [Millennium Development Goals] and cleaner fuels? Ban Ki-moon: As a means of addressing these climate change issues, having alternate resources, or renewable resources of energy, this is a very important aspect. I know that research and development has taken place in many countries, particularly Brazil has been in the lead of the group in the research and development of biofuels. In fact, the UN research report published this year underscored that biofuels [have] greater promise in addressing these global warming issues through low-carbon emissions. At the same time, as you suggested, it is true that there are some concerns expressed, by specialists or experts, on the possible impact on food security. This is also an area which needs attention. Therefore, I would encourage that both research and development and debate should be made. As Secretary-General what I would like to say is that again, the elimination of extreme poverty should be also a top priority. Therefore, how to reconcile or have some balanced development addressing these issues will be very important. I am going to discuss this matter when I visit Brazil, with Brazilian leaders, and look for myself. A statement is to be expected. Watch this site.